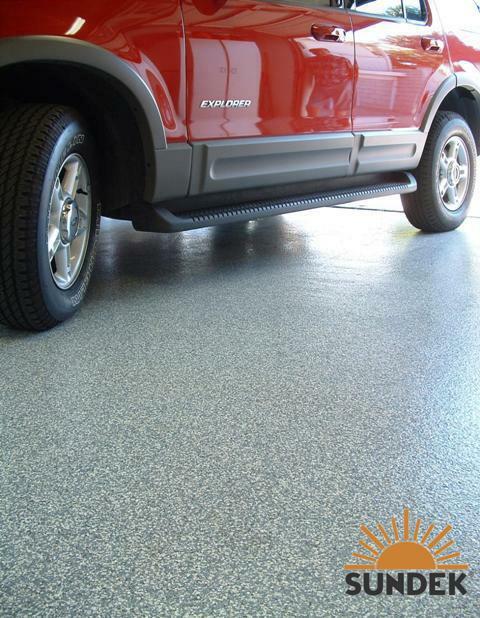 SunEpoxy is our 100% solids low viscosity, self leveling, penetrating epoxy product that is often used in combination with vinyl color flakes, or quartz sand that are broadcast on the surface. This combination provides extreme durability, filler and an esthetic appeal to the epoxy finish. The high build system provides a monolithic and seamless surface that can stand up to the toughest of applications. If a broadcast aggregate is used in combination with the SunEpoxy 100, the standard 20 – 30 mesh silica, or Monterey type sand or decorative color quartz work great. For a range of sizes and colors opt for the Vinyl color chips. Vinyl chip comes in a variety of colors and sizes and range from 1/8″, 1/4″, or 1/2″ and can give the look of granite or terrazzo. A double broadcast floor is the typical system used for applications such as industrial plants and food processing areas. This double broadcast can achieve a somewhat smooth and uniform appearance allowing for easy cleanup and movement of rolling carts and materials. The surfaces texture can be varied from aggressive to smooth for a range of slip-resistant finishes for wet areas such as showers and food preparation areas. A smooth “orange peel’ surface may be ideal if an easy to mop surface texture is required. This type of texture is best suitable for high traffic areas, laboratories, hallways, office buildings showrooms etc. Seamless, self leveling, monolithic, no grout lines or grooves. Withstands and repels a wide range of elements including oils, brake fluid, grease, slats fats and even red wine! These resinous flooring systems have a wide range of design and color options to choose from. Where to use it: SunEpoxy can be varied from aggressively slip-resistant for wet areas such as showers & food preparation areas to an orange peel texture suitable for offices, hallways or laboratories. 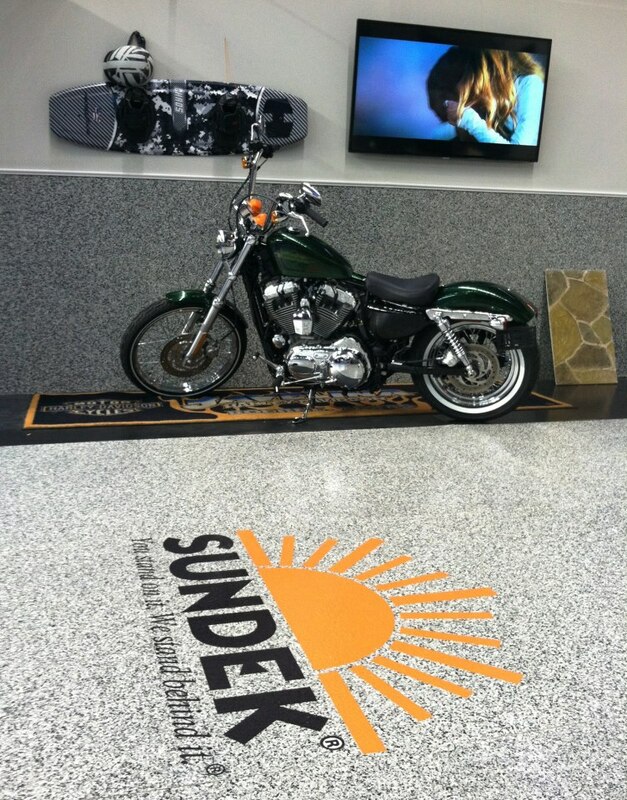 Add SunFlek, quartz beads or SunChips, solid or multi-colored vinyl acrylic paint chips to enhance the texture as well as the aesthetics of these dynamic concrete coating solutions. How it’s done: SunEpoxy can be applied by brush or roller in multiple coats. Once the first bond coat is applied, depending on the application, color chips or quartz beads can be broadcast onto the surface, providing slip resistance as well as decorative look. A second top-coat is then applied to lock in the additives and add an additional protective layer.